I just love this kind of dinner. 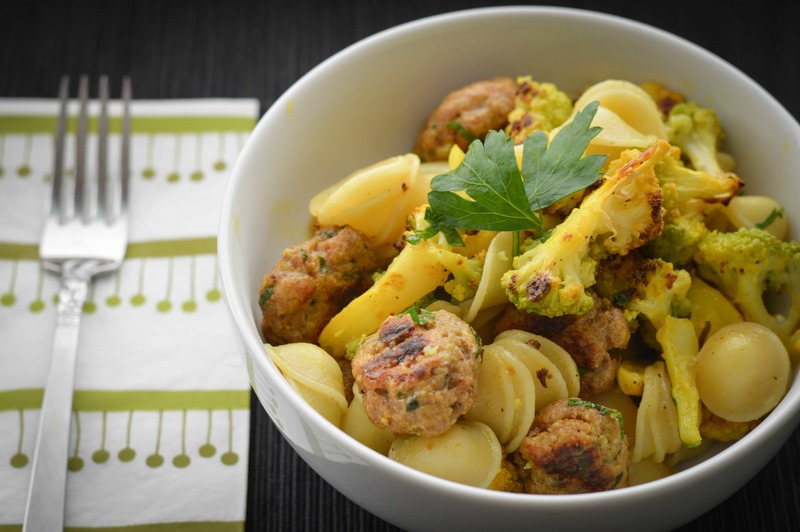 Toothsome orecchiette (that’s Italian for “little ears”) are tossed with Moroccan-spiced turkey meatballs and turmeric-hued florets of cauliflower, and a quick dressing of garlic-infused olive oil, Meyer lemon juice and freshly chopped parsley livens up the dish just before serving. The whole thing comes together in about 45 minutes, making this an easy, one-bowl meal. 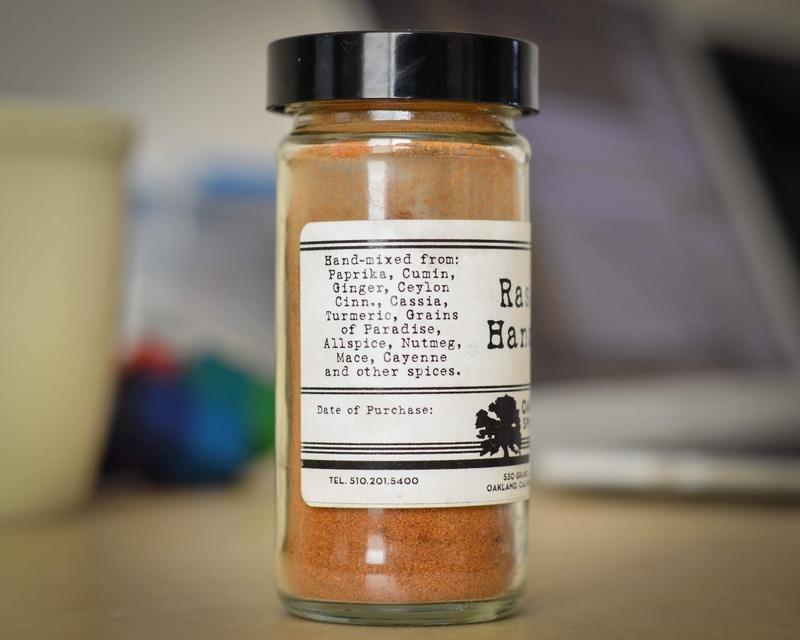 Ras el Hanout is one of my favorite seasoning blends. North African in origin, it sounds exotic but the flavors are familiar and comforting. I used a fantastic rendition from Oaktown Spice Shop to flavor the meatballs in this recipe. 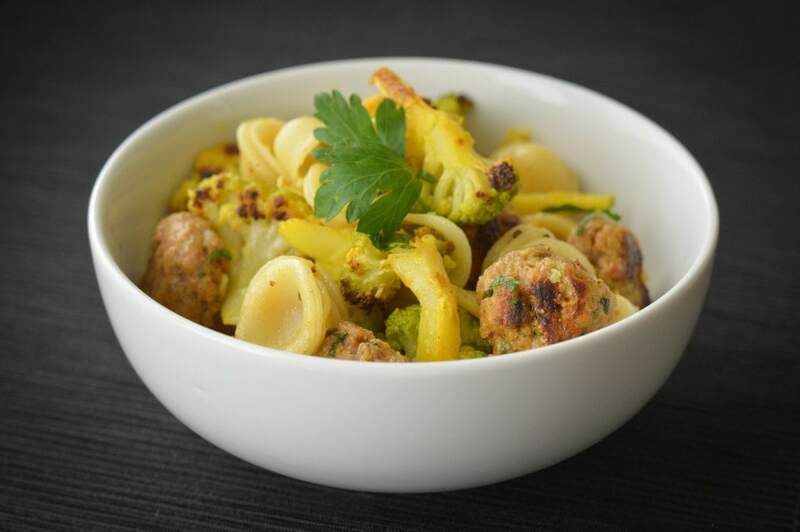 The combination of roasted vegetables and meatballs with chewy pasta is a great one. 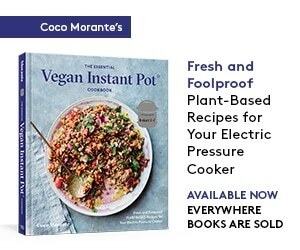 Furthermore, roasting your ingredients allows for a mostly hands-off dish — once everything is in the oven, all you’ve got left to do is boil a pot of pasta, then toss everything together before serving. 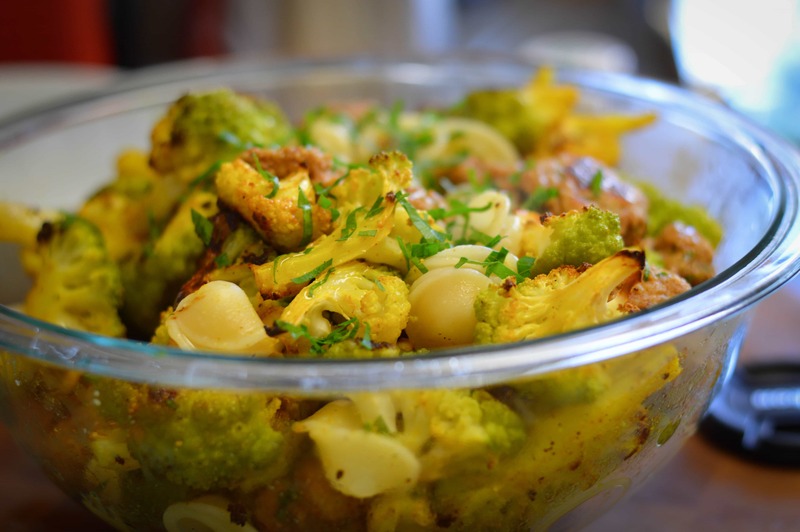 Oh, and how’s this for an aesthetic bonus: the turmeric from the cauliflower colors the pasta a beautiful vibrant yellow, making your dish healthier and prettier to boot. Preheat oven to 425ºF. Line two baking sheets with parchment paper. Place a large pot of water on the stove over high heat. Slice cauliflower into florets and place on one of the baking sheets. Sprinkle with one tablespoon of the olive oil, turmeric, salt and pepper, and toss to coat evenly. In a medium mixing bowl, combine the ground turkey, bread crumbs, egg, half of the lemon juice, parsley and seasonings. Stir until evenly combined, then roll into 1” meatballs. Place meatballs on the remaining lined baking sheet. Place the cauliflower in the oven for 30 minutes. After the first 10 minutes of cooking, place meatballs in the oven (they will cook for 20 minutes, and be finished at the same time as the cauliflower). 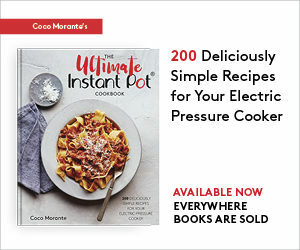 After you place the meatballs in the oven, season the pot of boiling water liberally with salt, then add the orecchiette pasta and let cook for 12 minutes, or until al dente. Drain the pasta. 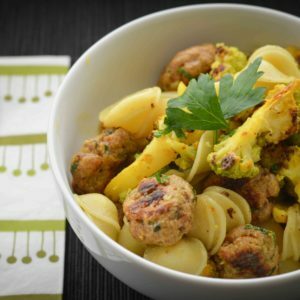 In a large serving bowl, combine cooked pasta, meatballs, and cauliflower. Toss with remaining Meyer lemon juice, two tablespoons olive oil, and chopped parsley. Serve.